Keeping your pool cover intact can be trickier than you might think. Keeping your pool cover intact can be trickier than you might think. Every time you start to open up your pool as swimming season approaches, you notice something is wrong. After a few years, it could be time to replace it. Until then, you need to answer this question: what’s wrong with your pool cover? Let’s take a look at the anchor hex hole, or where you put the Allen key. It could be rounded smooth, which is a sign of bigger problems. It could also be stripped, or full of dirt, dust, or sand. All of these will interfere with the hole and the pool anchor. A large flat head screwdriver could be your best friend in this situation. That’s because all you need to do is knock the head of the screwdriver into the hole with a hammer. Go deep enough that the head locks into place. Then use some pliers to turn the screwdriver. Make sure that the insert isn’t seized up; this can present another problem that you will need to overcome. Some locking pliers can set things right. Replacing the current anchor with one made of brass could be the answer that you need. What does it mean when the anchor is seized up? In short, it’s when it gets stuck. Use a saw or a power drill to work on the hex key and give it a new tip; chances are, it’s just dull. Using some lubricating oil can make a remarkable difference as well. Give it a few minutes to work its magic and try turning the anchor insert. Another solution is to move it back and forth until it comes free. Sometimes, the issue could be that the pool anchor spins when it’s not supposed to; this is one of the most complicated problems for residential pool owners. If the hole for the anchor is too big, or the anchor is placed incorrectly, then the anchor will start to spin. Use pliers and the hex key to yank the anchor out of the hole where it typically goes. If it is part of the way out of the hole, using a screwdriver can do the trick. Lubrication and locking pliers can help move it if it is stuck. 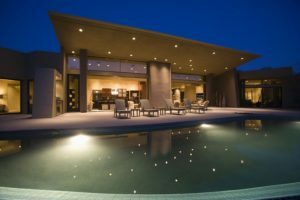 If you still have questions about how too much water can do damage to your open-air pool, Sunrise Premiere Pool Builders LLC is here to help you. We here at Sunrise Premiere Pool Builders LLC can build and install your pool or spa and also provide you with pool chemicals, services, and more. If you have questions, feel free to give us a call at 410-349-3852. To see more from us and for tips and tricks, be sure to follow us on Facebook, Twitter, Pinterest, and LinkedIn. This entry was posted on Friday, April 12th, 2019 at 3:09 pm. Both comments and pings are currently closed.